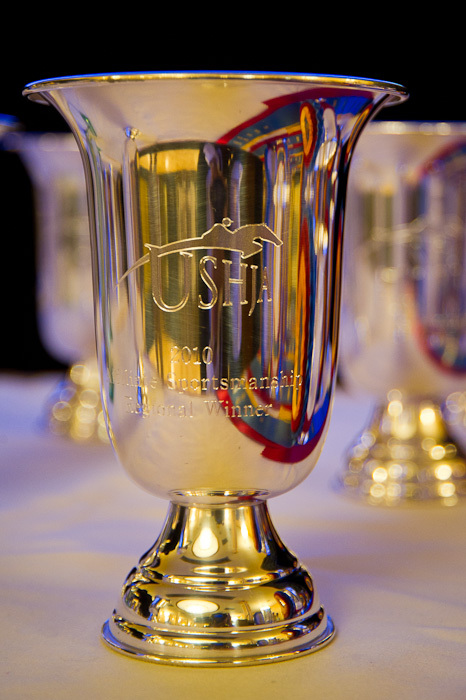 The United States Hunter Jumper Association Annual Meeting is sprinkled with awards ceremonies. I’ve always enjoyed photographing these events as I know how difficult it is to earn one of these coveted awards from the sport’s affiliate organization. I enjoy watching the smiles and tears of joy as recipients step up to the stage for their ribbon or silver trophy. Working with horses is different from many other endeavors because your partner is another being with thoughts, feelings and desires. To establish a relationship with a horse that consistently produces winning results while avoiding the pitfalls of injury or other setbacks is quite an accomplishment. For those who persevere, though, the rewards are intangible, and although it’s wonderful having a small token of appreciation to set on your mantel, often the ability to reflect on the journey for years to come is the truest reward.